C'est la proposition faite par la FIVB, avec un maximum de 3 par équipes et 2 qui peuvent jouer en même temps. D'après la FIVB cette proposition vient des fédérations nationales dans le but de faire jouer un maximum de jeunes joueurs. En francais ca donne quelque chose comme ca. l’identité culturelle de leur pays. les décisions de leur FN. 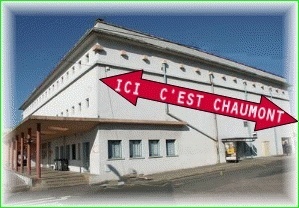 nombre de CTI par club. C'est signé aussi pour moi. Géraldine a toi de jouer..
1- The FIVB wants to change the rules and limit the quantity of foreign players in every federated league. Could you tell me which the objective of this decision is? To what extent do you think it is possible to achieve it? “The FIVB is not changing rules or imposing limits on any player. The goal of our International Federation is to develop the sport and allow young local players to find a deserved space in their own countries’ championships. 2- Have you thought of other measures which look for that aim? “Some National Federations have been trying for years to reach this objective, some of them even succeeded through gentlemen’s agreements among Clubs. But the request of having more young and national players on the court still comes from National Federations and the FIVB Board of Administration has discussed the different ways to practically implement this basic idea. 3- On May the counsel will make a proposal, will this one be approved in Dubai in June, or is there a possibility of it being modified between the two dates? “On May 12 the Board of Administration will gather in Lausanne to prepare the final wording of the proposal to be voted on in Dubai. The Congress will have the final decision. 4- Do you considerer the possibility of reaching a consensus on the proposal of May, before the final debate in June? In that case, who could be the adequate interlocutors? “We’ve already discussed the proposals with many National Federations’ Presidents. The Board of Administration, composed of 31 members coming from 31 different countries all over the world, is is adequate in itself. The 220 National Federations affiliated to the FIVB will all have their representative in Dubai. Is it not the best consensus? 5- The last information from the IFVB was no clear in the point of the number of foreign players in a team. The clubs are now making their teams. Don't you think that this situation is negative for the clubs? “With the implementation already sent to all National Federations we are not absolutely fixing a number of so called ‘foreigner players’. Everyone can check this information, we have published it in our official media info magazine World Volley News. Every Club can have all the players they want or they need. The FIVB has proposed a maximum number of players with International Transfer Certificate who can be on the court at the same time. The maximun number will be two. We fully understand that some Leagues could not have been ready for the change. That is why, only for two years and if the concerned National Federation agrees, they can have three ITC players on court. A Club can request all the ITCs they want, if they have no pending salaries from the previous seasons. 6. do you think that the measures must be applied from next season? Isn't it too early? “National Leagues are supposed to be composed of Clubs with players of the same nationality. It is never too early to establish this principle. 7- At first, the common players weren't considered foreign in the EU League, at least for two seasons. But in the last communiqué from the IFVB, it doesn't make any distinction between common players and the rest. Does it mean that they consider adequate that the limitations affect every foreigner? In that case, why does it happen? “We are focusing our implementation, sent to the National Federations on April 3, on the ITCs. We don’t talk about limitation, as we’re not making in this document any reference about EU players. As for FIVB rules, for years, we’ve stated that every player, even for a University League, needs an ITC to be registered in a club of another country. Anyway, the FIVB is open to discuss specific situations with National Federations that approach FIVB with that purpose. 8- However the European legislation forbids the limit of common players in its territory. There is a famous precedent in football with the Bosman affair. What are you thinking of doing about this? What could happen if players, clubs, and other organizations appeal the rules to the common courts? 9- May the IFVB stop processing the ITC's until the new rules are passed? In particular, until May or June? “The FIVB will never stop the ITC process. If a Club needs to hire players coming from another National Federations, they are free to apply for the procedure. 10- In Spain, almost all the clubs disagree with the quotas, and the clubs that agree with this idea, disagree with them being applied next season. Did you expect such a negative reaction? “The FIVB archives are full of articles which reported negative reactions to the first World League and the application of the Rally Point System. Every action has a reaction; it is Physics, not Sport. History will tell if it is a good decision or not. 11-Don't you think that this limitation of foreign players could start a massive process of naturalization in every country that adulterates the competition? “To be considered a naturalized player, an athlete has to demonstrate that he (or she) has been living for two years in a country and owns a passport released by that government. If he (or she) wants to play in the National Team, he (or she) has to wait two more years after obtaining the new passport and changing their Federation of origin. The Clubs have no limit for naturalized players but each National Team may align only one. Changing nationality is not a finger snap. Je m'y colle dès que possible ! - Ils ont discuté du problème des joueurs qui n'avaient pas la possibilité de jouer dans leur propre pays. "-Chaque club sera libre d'avoir autant de joueurs provenant d'autres fédérations nationales qu'ils le veulent, sous les conditions définies dans le cadre d'un certificat de transfert international. 3 ans sont donnés afin d'obtenir seulement 2 joueurs d'autres fédérations nationales sur le terrain en même temps. Chaque fédération sera capable d'autoriser 1 joueur supplémentaire (joueur remplissant lui aussi les conditions d'un certificat de transfert). Cette nouvelle règlementation est la décision finale après discussion avec les fédérations nationales." (i)Le nombre de joueurs avec un certificat de transfert international (ITC) qui peuvent jouer en même temps sur le terrain pour équipe ne doit pas excéder le nombre de joueurs de la fédération "locale" de l'équipe. De préférence, ce nombre est de 2. Cependant, une fédération nationale peut autoriser un joueur étranger supplémentaire. (ii)Les fédérations nationales peuvent garder les règles actuelles pour la saison 08/09. Pour 09/10, les fédérations pourront partiellement appliquer les nouvelles règles. Pour la saison 2010/2011, les nouvelles règles devront être totalement appliquées. f) Les Ligues nationales pourront avoir une saison de "matchs joués" entre le 15 octobre et le 15 mai si elles sont obligées de laisser partir des joueurs d'équipes nationales dans les conditions définies avec les fédérations et dans le certificat de transfert."